Playground is important for the overall growth of children but the thing you should not forget is their safety. It is often seen that many children get injuries while falling from the playground equipment. Therefore, you should give primary importance to the safety of your children. The surface of the playground should be made of rubber. The rubber surfacing will ensure that children will not get severe injuries. 4-6 inches of rubber mulch is enough for 12 feet playground equipment, which is a standard size of any equipment. Rubber mulch is made from recycled rubber, which can be used in gardens or backyard areas. But it requires maintenance after a regular interval of time. You can also go for other surfaces like artificial turf, which is maintenance free. But the only drawback with this is that it is very expensive. On the other hand, rubber mulch is cost effective and available in several colors and pavement designs. It results in no or very less injuries, as it bounces back your children when they fall on it. Playground equipment is of two types – indoor and outdoor. Indoor playground equipment includes climbing decks, indoor tubes for crawling, and indoor slides, etc. This equipment keeps your children safe from outdoor hazards and it will be convenient for you as well to keep a constant eye on your kids. On the other hand, outdoor playground equipment includes swingset, seesaw, jungle gym, outdoor slides, merry go round, chin-up bars, etc. Installing playground equipment outside in your backyard is a better option as your kids will a lot of space to enjoy themselves. As far as safety is concerned, you can also install shades to keep your kids safe from harmful Ultra-violet rays and scorching heat. Shade structures also come in several designs, colors, and sizes. Besides all those safety measures, your constant supervision is also required. As parents your top priority should be the safety of your kids besides all the fun and entertainment. But also make sure that you should not disturb the kids again and again in order to show concern about them. 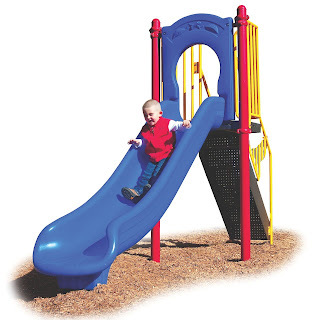 Let them enjoy to the fullest at playground slides and other equipment.